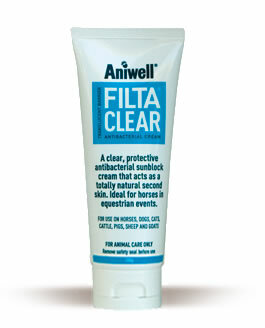 FiltaClear is a totally clear, protective antibacterial sunblock cream. It acts as a totally natural second skin. Suitable for cats and dogs - has bittering agent to minimise licking. Skin conditions that need to be treated prior to or during shows and competition events. FiltaClear gives a minimal white filming cover to protect sensitive and damaged skin areas from exposure to both sun and wind. FiltaClear has effective antibacterial qualities that will prevent foreign contaminants and dirt matter entering the protected skin areas. provides high sun-protection factor with antibacterial cover. FiltaClear is suitable for many animal species including horses, dogs, cats and kittens. It contains a "bittering" agent to minimise licking in dogs and cats. However, it is not suitable to apply to the teats of lactating animals, around the mouth area and not to be used for dairy cows. Search our FAQ to see if we already have the answer for you.